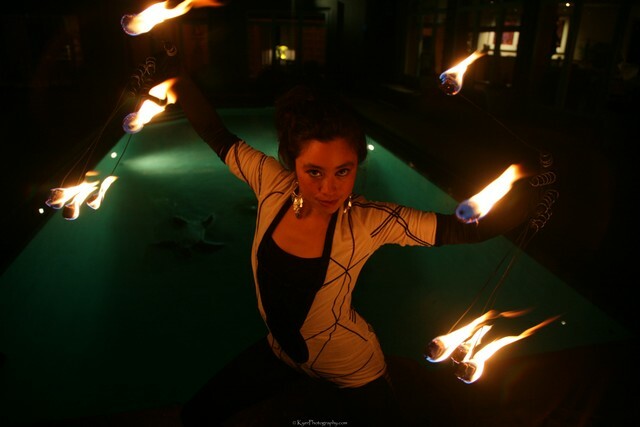 Nocturnal Sunshine is a visionary fire-dance troupe based in Santa Cruz, CA. We blend several performance mediums including spectacular fire art, stilting, aerial dance and glow tools with theatrics, original costume and dance. Our troupe has performed for awe-struck audiences since 2000. Nocturnal Sunshine provides unique entertainment for private parties, corporate events, weddings, and festivals. We perform with live musicians, DJs or recorded music. Shows are customized to complement the spirit and theme of each event. Such flexibility is made possible by our extensive repertoire of creative costuming, musical, and choreographic visions. Whether you need one dancer for 5 minutes to wow your audience or the entire troupe to entertain for an hour or more, we can add to your event in ways you never imagined. We also collaborate with many other performers. If there's something you're looking for, just ask.